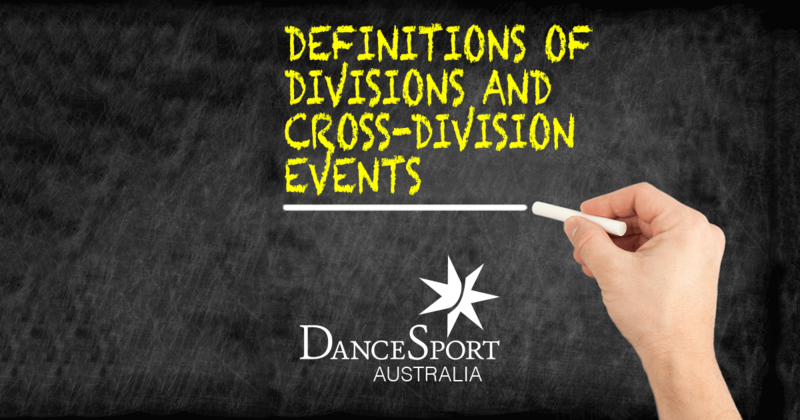 What is a sporting 'Division' and why does DanceSport use them? A "Division" is a grouping of competitors who comply with a particular set of regulations. Each has their own set of rules. All DanceSport competitors will be registered in one of these Divisions. There are no choreography restrictions in the Professional Division, but you need to maintain the Dress Code. See DSA Restrictions on Competitor Dress (page 8). Same dress requirements as per the Professional Division. Recreational Competitors must adhere to the DSA Restrictions both for Competitor Dress and Approved Syllabus. Details are in the technical reference books. Ask your Coach if you are unsure about your choreography. DanceSport has 'Divisions' so competitors in each Division have the same set of rules. To use a sporting quote, this is to create a 'level playing field'. There are, of course, basic rules that apply to all competitors regardless of the division. These are generally to do with safety. An example is 'lifts'; the lifting of one partner off the floor by the other is a safety issue for everyone concerned. In all Pro/Am events it is the couple the Adjudicators will assess. The man/leader will wear the back number and the Skating System will be used. This does mean that a Professional cannot have multiple partners in the same event. In these events, Amateur Division rules will apply to all participants. The Adjudicators will only assess the Student, therefore the Student must wear the back number. Recreational Syllabus and Dress Rules apply to this Cross-Divisional event. As with Teacher/Student, it is the Recreational competitor who will be assessed.